In the Apple iTunes iStore you are having some Apps mainly games and some navigation apps which are more than 100MB in size and as you will be tempted to get your hands on some of the Apps and start the download, and after downloading some MB you plan to go through iTunes and you find an even better App for the same purpose , so in the previous versions of iOS that is the earlier versions before iOS 4.3 you were not having an option to delete an App which was downloading you were only having an option to Pause the app and resume the Download later. But for people who are using iOS 4.3 you have the option to delete the App which is in the process of downloading which was not possible with the earlier versions. Once you have started the download the Downloading app will be place in the last online casino page as the last app and you will be able to see the blue bar filling while the download is being complete. You have to just TAP on the Downloading app to pause the Download. 3. And to Resume the download you have just TAP the Pause App once again to Resume the download. Go to the Page where the Downloading App is present and then Press and hold the App till you can see that all the Apps are vibrating vigorously which is the indication that the Home page is ready to be edited and the downloaded apps can be deleted. Once the App enters into the vibrating mode you can see a “X” badge on the left top corner of the app which helps in deleting the app. After you clicked the X badge a Notice Box will Pop up asking you whether to Delete or Cancel. Press Delete button to Delete the app or Cancel to stop this actionif you have changed you mind in the meanwhile. After you have hit delete the app will disappear from the phone memory. 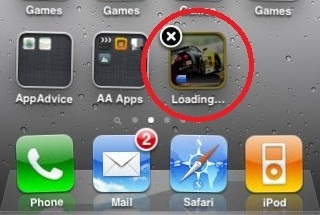 With the iOS 4.3 you no longer have to wait for the App to be downloaded, you can delete it even when the app is getting installed or downloaded.